Its with a great deal of sadness and some trepidation, that I announce my official retirement from custom diecast paint works. First, before I go any further, I would like to say thanks to all my customers, fans, and friends for all the support and love over the years! Painting custom diecast has made it possible for me to meet a LOT of GREAT people and share momentous experiences with friends from all over the world. Those friends and memories are something I will never forget and will forever be honored to be a part of. I am announcing this change now, but in reality, this has been coming for quite a long time. Ive not done any new paint work of my own since sometime early in November of 2015. I have since worked on some in process work, but thats all as far as my own paint productions. I have worked on occasion, in a designer capacity, with my good friend Dino from LB Customz (and plan on doing more designs for Dino in the future) but several things have gotten in my way and caused a block in my own productivity. My wifes health, since her cancer diagnosis in 2013, has been my primary focus during her battle with the disease and its treatment. That has been perhaps the biggest factor and left very little time, also made it difficult to have inspiration to perform the paint work at the level I want and am known for. My own health has also been a major factor in this. I suffered my forth heart attack in April of 2016, and really, most of the time, its all I can to to focus on my wife’s and my own disabilities from our respective health problems. We havent given up by a long shot and do not intend to do so by any means…however…the stark reality is that normal tasks are now more difficult, take more effort, and sometimes are not possible as they were just a short time ago. Unfortunately, I didnt realize just how much physical and mental effort it took to perform the paint work on such a small surface area. I have always just did whatever it took and most of the time it just sort of “flowed” when doing these tiny works of art. But over the last few years, it has become increasingly more laborious and taxing to complete diecast paint art works. In addition, the overall custom diecast market has been waning for a couple years now..and after 17 years of painting diecast, so is my passion. I just do not enjoy doing it as I once did and the monetary compensation is simply not enough anymore. As such, I believe it is time to pull the plug so to speak and move on to something that will better fit my situation and its restrictions. I am truly sorry for the delays in a few very delinquent special orders that unfortunately have fallen into this trap of health and drive issues. Ive been trying as best I as can but, its just had to take a second spot to my wifes needs, not to mention my own at times. I have been working on and do fully intend on completing the orders that are overdue. As well as a couple commitments for charity auctions at upcoming conventions and hopefully, a small lot of “Final Run” KB Kustoms. Then however, I intend to indefinitely discontinue my own paint work on diecast pieces. As time allows, I do plan to continue working with Dino, doing designs in a collaborative position. Thanks you so much!! 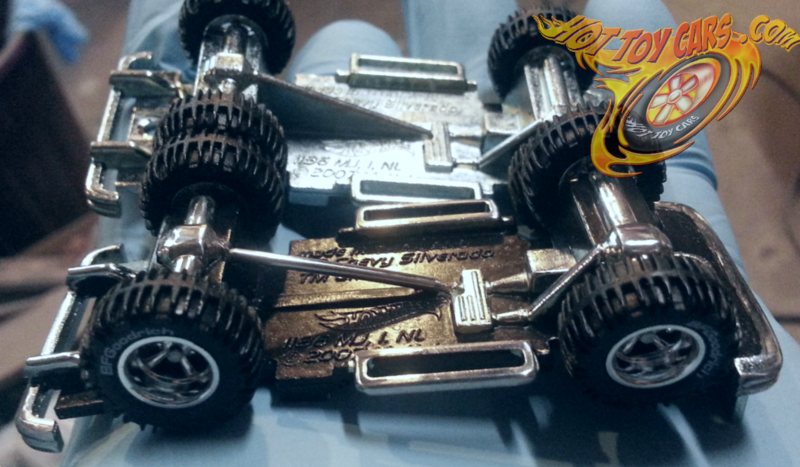 Ive had a great time doing these Hot Toy Cars! But, its time I move on to something else and continue caring for my wife and self. I very much appreciate your consideration and patience in the transitional period. Watch for the final run cars and my future design works with Dino, which will be posted and sold here on Hot Toy Cars. 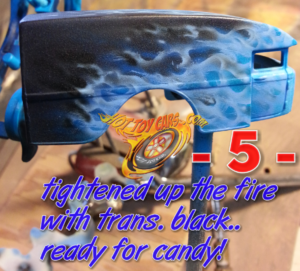 WIN THIS DRAG BUS!!! Limited entries available! Ok…as you may already know..(or not..lol)..
Ive got a little offer for those of you willing to take a little chance. 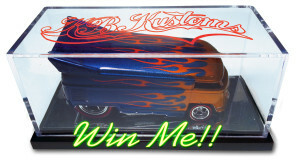 You could win this KILLER ALL PAINT 1 of 2 Custom Drag Bus!! And it could be yours for as little as TEN BUCKS!!!! Thats right, I said $10. Yes its possible you wont win anything, thus the gamble…but, its not everyday (if ever) you can get a piece of this quality for such a price, so, just let that sink in for a minute…click the link and look over the pics and description of the bus, and read the rules and exclusions (aka..fine print)..then make your decision. Now….know that the drawing will be held this coming saturday, and there are a LIMITED number of entries being made available, so if you want to play…dont wait too long!!! Once the entries are sold, thats it..no more will be made available. Ive had a few of these raffles in the last few years, and most of them did sell out. 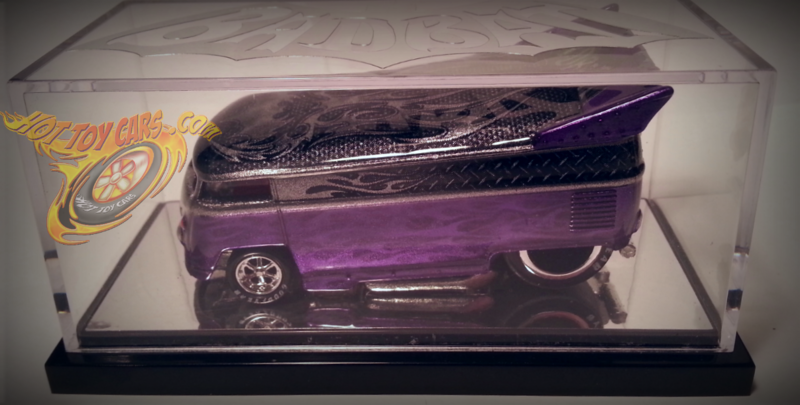 This is the first promotion of this kind Ive done via the newer Hot Toy Cars.com site tho. Also, for those purchasing 2 or more entries, you WILL at the very least receive a large HotToyCars.com vinyl decal!! Oh and even my friends outside the US are welcome for this event, but, will be responsible for additional charge to cover shipping. So go get yourself an entry or two and have fun participating!!! The last of ONLY TWO.. This bad boy features Special Pro Circuit 6 spoke wheels on front, white letter Goodyears with sanded treads all around for a rubber appearance. Signed, numbered, and dated on underside of body. 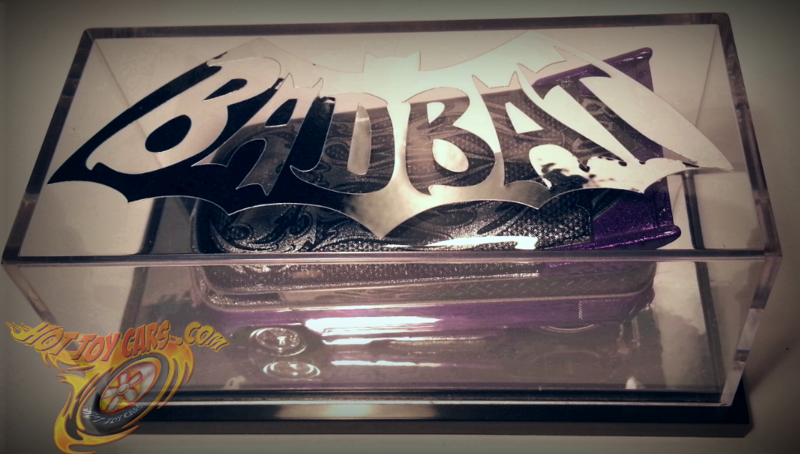 Mirrored case bottom with chrome BadBat logo on top of acrylic display case. Case also features fitted foam padding and shipper box for added protection. 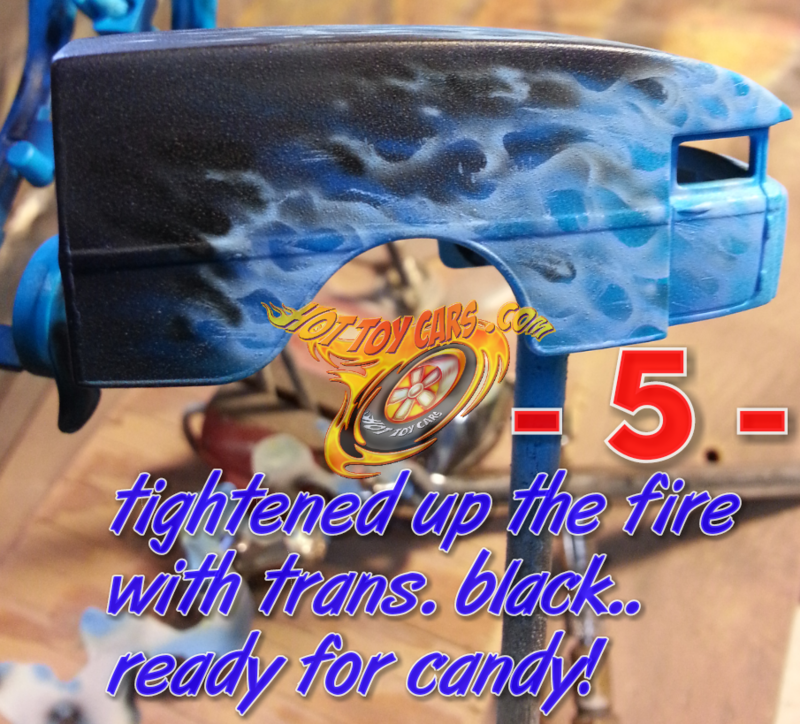 Just put the last layer of flames (4 total) on this 1 of 1 VW drag Bus! Needs details and it will be ready for clear. 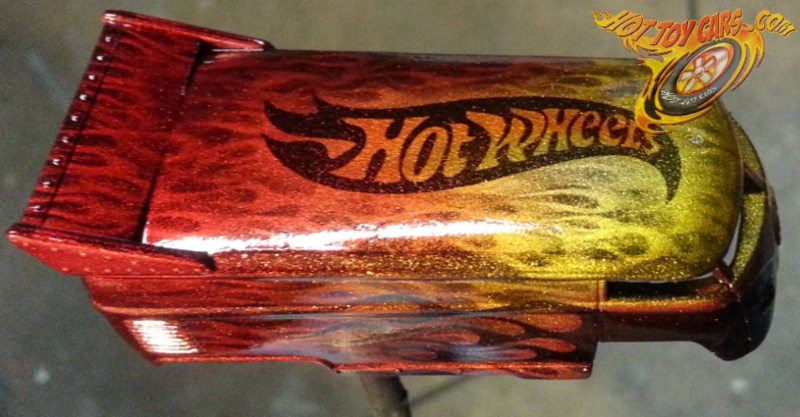 100% Paint btw with BlackCherry Pearl HW logo and two tone side/nose flames! Coming soon! Here is a side by side comparison of a stock silverado 4×4 chassis and the one I’ve just finished for the Blue Blazes edition one of one. Smoothed and polished bumpers, grill, side steps, front and rear axles/differentials, plus hand painted blackout chassis and drilled exhaust tips. Of course the most notable mod is the custom made rear drive shaft! Old solid block style “shaft” was drilled/cut/removed and ground very smooth so as to not catch the eye. Then two holes were drilled in chassis where the drive line should attach. Stainless steel tubing was cut to length and ends beveled/polished. It was then mounted using brass rod in each end. The tension holds the shaft extremely stable but still was given a drop of epoxy for lasting results. 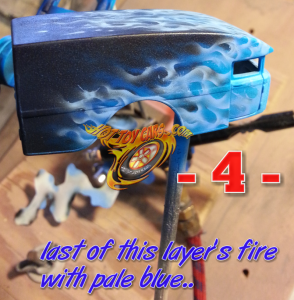 Process Shots : Blue Blazes FIRE!! 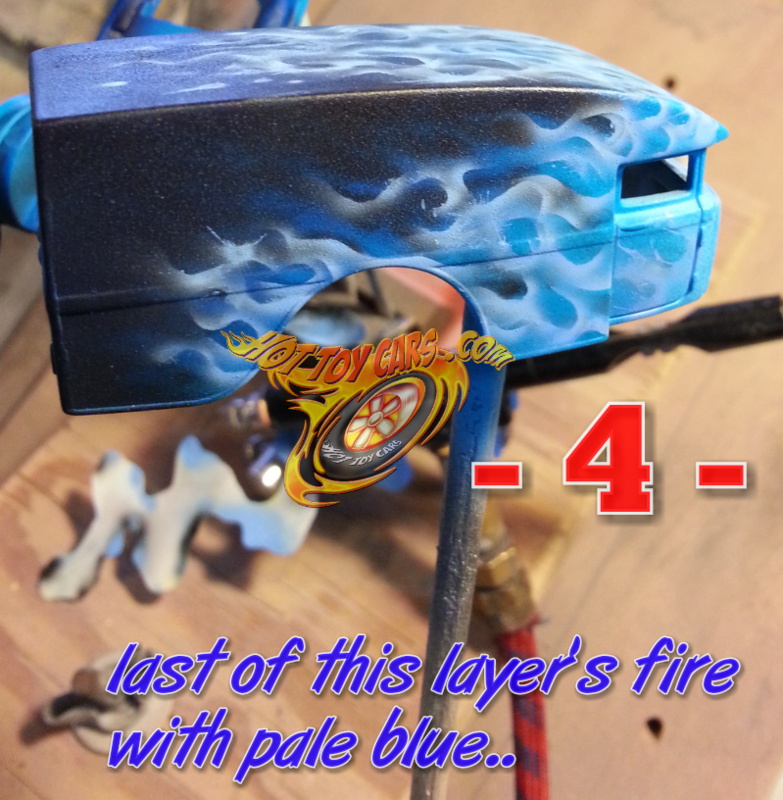 How about a rare peek at my Blue Blazes FIRE technique?? 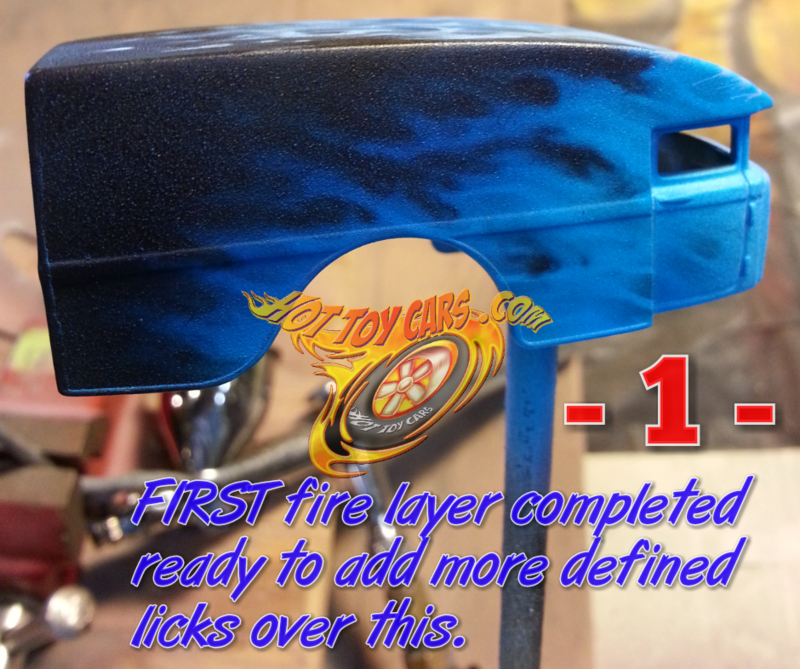 STEP 1 ~ loose fire added and coated with candy blue. This layer is the first one and is eventually going to be more of a glow or background when subsequent layers are applied. So it is done loosely, mostly freehand with the nozzle of the airbrush tilted at a 45 degree angle, blowing towards the rear of the casting. STEP 2 ~ Starting to add tighter, more defined fire licks. Now I begin adding tighter defined licks with a mixture of AutoAir Wicked detail White, Transparent Base and High Performance reducer. Its almost a milky looking liquid. 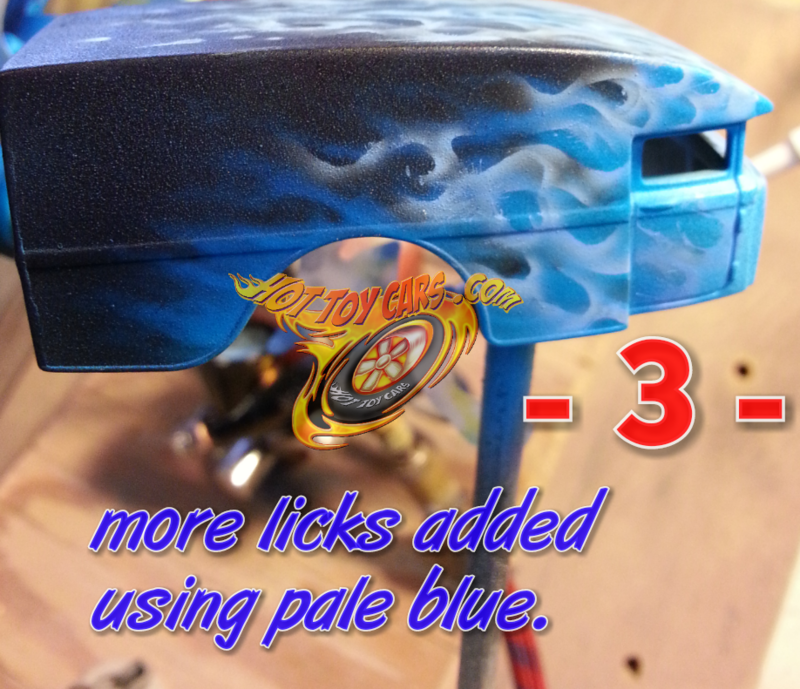 2 drops of Detail Blue wicked is added to the mix when in airbrush. 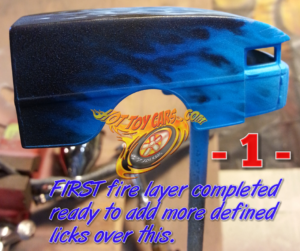 I am using a Badger Sotar for this step and HotDawg stencil from FlameMasks.com to create the fire licks. STEP 3 ~ More licks added. Adding more fire licks. Notice these licks generally are inside the confines of the first layer but do not follow it completely. The first layer also acts as a “road map” of where the fire will go on in subsequent layers.. STEP 4 ~ Fire licks of layer 2 are completed. And the last of this layers fire licks are done. Notice these licks while more defined than the previous layer, are still a bit wide and loose. This is how each layer should progress. Each layer becoming tighter and more defined than the last while still not following the same paths exactly. STEP 5 ~ Erasing and defining the licks. I used a trans parent black to define and “erase” unwanted licks or areas of the 2nd layer fire licks. This should be done with care. STEP 6 ~ 2nd Layer completed with a few coats of candy blue. This is the final step for the second layer of fire. 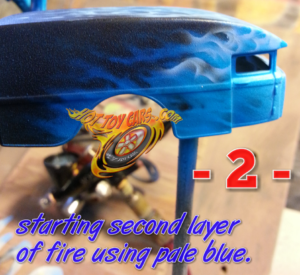 Candy blue is applied in several light layers fading from dark to very light towards the front. 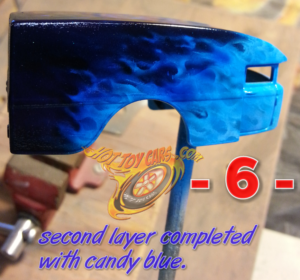 More layers of candy are applied at the rear than the front, creating a fade in the color. 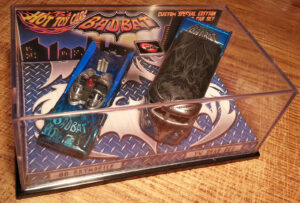 LAST BadBat Two Car SET coming up FOR SALE this WEEKEND!! 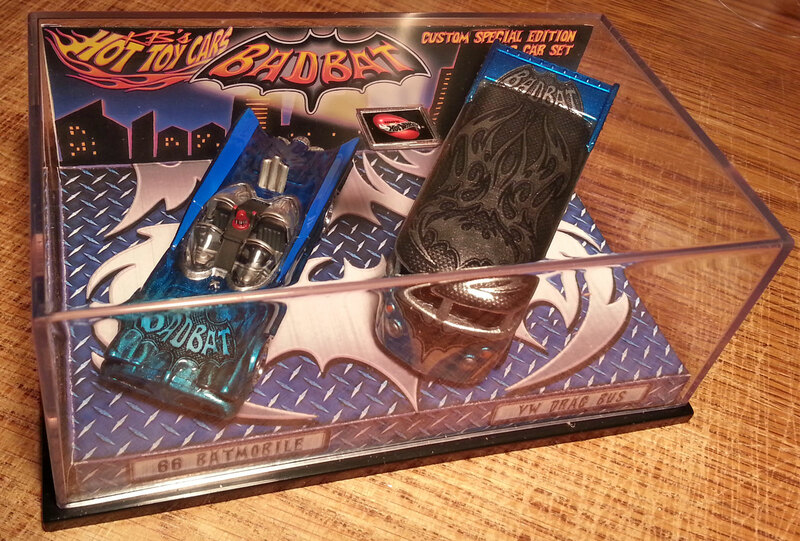 GET READY…THE LAST BadBat TWO CAR SET is coming up For SALE THIS WEEKEND!!!!!!!!! Its gonna have a SPECIAL PRICE too. Likely will go fast!! Sell it at a discount..which is what Im going to do. The imperfections do not detract from the overall look of the bus. Everything looks like the rest except a few ultra tiny specks on the sides, near flames. If I didnt tell you about them..you likely would never even notice, because they are that minor. However, I strive for perfect finishes, like the top and rest of the bus turned out. But again I hate to strip it for these minor issues…so keep watching for start time. I will send it to our newsletter subscribers first, then post on the Hot Toy Cars blog and social media pages within an hour of start time. I dont know if it will go as soon as it listed or remain available for several days?..but the other two sets sold quickly..and THIS is the LAST ONE…so you never can tell.